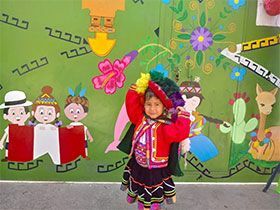 Founded by a Dutch family, Hogar de Gina is a non-profit organization in Peru that shelters girls who have been abandoned, who have suffered physical and emotional abuse, or who are otherwise disadvantaged. The shelter is a sanctuary to eighteen girls aged 1 to 21 years. Dulce is a five-year-old who lives at Hogar de Gina. She was rescued from the jungle at age 2. Her mother had died and her father was incapable of taking care of her and her two sisters. Separated from her sisters, she arrived at Hogar with PTSD-like attachment issues, afraid to sleep in her own bed. Now, she is thriving – singing, reading, writing – and is about to graduate from kindergarten! Service Council is holding a bake sale, “Dulces for Dulce,” on Monday, November 26 in the senior lobby (recess and lunch), with proceeds going toward her kindergarten graduation. It would mean so much to Dulce and make her feel included if she could graduate with her peers. In Skyping with the girls and connecting through letters, we feel lucky to help this amazing cause and are excited to make a difference in these girls’ lives. If interested in joining this initiative, please contact Ms. Rosen.